Water Filter to Reduce Beach Closings? levels at New York beaches. The technology could reduce swimming bans at city beaches. For the Great Lakes Radio Consortium, I’m Chuck Quirmbach reporting. The Lake Erie water snake is listed as threatened under the Endangered Species Act. The U.S. 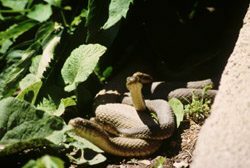 Fish and Wildlife Service is developing a recovery plan for the snake – and people who live near the snake are also giving it a hand in recovery. Photo courtesy U.S. Fish and Wildlife Service. on rocky limestone islands in the western basin. And they can grow up to five feet long. habitat. And in the past, people have killed the snakes out of fear. Megan Seymour is a wildlife biologist. She works for the U.S. Fish and Wildlife Service. never owned an outdoor television antenna. life. And I was determined to do so. satellite dish system. For a few dollars a month, I could get hundreds of channels. eyes, my lack of passion for personal improvement was a serious problem. realize it. We’re constantly foraging for the latest gadgets, newest cars and biggest homes. Never mind that such desires usually bring more headaches than they’re worth. resources for a larger war effort – the President of the United States told us to go shopping. are. True spiritual growth and contentment rise from uncluttered lives. stress, possessions, competition and isolation. natural world that sustains us. against the impulse to buy things that I think will add joy and value to my life. They seldom do. to live and grow and love without constraint. And that’s probably the clearest signal I’ll ever get from that battered old antenna. burned, usually with coal in coal-fired power plants. In the case of growing miscanthus, the process is much different than that of most Midwest crops. miscanthus can reap great rewards in the long run. miscanthus. That’s pretty good money for the farmers. The reason dynegy will pay that much? Illinois power plants. But the company doesn’t know how many farmers it will be able to find. shipping, and burning grass effectively. with the environmental law and policy center, which advocates renewable energy in the Midwest. Detweiller says miscanthus could fit that billing, but other biomass crops might be more suitable. because it does not grow nearly as thick as miscanthus allowing wildlife to forage more freely. Brown says the crop he’s grown in Ireland for a dozen years will only perform better in America. common. They represent a future where the energy we mine today could eventually be mowed. 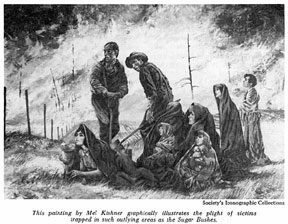 Many families attempted to escape the Peshtigo firestorm of 1871 by hiding under wet blankets. Most people did not survive. Painting by Mel Kishner, courtesy of Deana C. Hipke (used with permission). like other mill towns in the upper Midwest. farming. And the men clearing a route for the new railroad burned whatever was in their way. 1871 was a very dry year. the Fireground, a reflection on the Peshtigo Fire and his own experiences of firefighting. fires in those days,” Leschak adds. fires were burning all around, but people saw fire as a good thing. happened at Peshtigo that day. On October 8th, a huge cold front swept in from the west. piles and the dry conditions combined to create a conflagration. flames. That caused more hot air to rise. once, and the winds were roaring at a hundred miles an hour. in a fury over their heads. Some of them survived. Leschak estimates the ambient air temperature at 500-700 degrees. American history. The survivors rebuilt the town, but it wasn’t a booming mill town anymore. But that wasn’t the end of the monstrous fires. Leschak says the timber companies were making too much money to quit. Learn more about the Peshtigo Fire. the humpback whale and the American pine marten, just to name a few. fulfils the international commitments Canada made under the Biodiversity Convention. species which are found to be most at risk. Ottawa has finally accepted some of the responsibility for protecting species and their habitats. whether an animal will be placed on a protected list. Killing River to Stall Spread of Invasives? Scientists say killing part of the river would create a barrier no fish could swim through and live. Removing the oxygen is against the Clean Water Act, but biologists think it might be worth it. shut down for a minimum of two years and then re-oxygenated so that living things could return. strong laws to make NAFTA environment-friendly. environmental policy when it comes free trade.